For a country that seems to love pizza, the combination of hand-tossed pizzas and craft beer though seems to be lacking. The artisanal craft of making dough from flour, yeast, and water is as old as making beer, with it’s malt, yeast, water, and hops. Yet in Japan, there are plenty of places that offer up handmade pizza – no, not Pizza Hut or Pizza La – but authentic Neapolitan style, and plenty of places that have craft beer on top. So why not combine them and offer up pizza and craft beer? This guide is for those wanting to have some pizza and craft beer – I know I love the combination and if someone asks me, these are the places we recommend for the great combination. Pizzas MUST be made in store and not from bought – so no places that order in pizza for you. Pizza HAS to be the main focus for food in the bar. Pizza with something else is fine, but pizza as an afterthought is a no-no. Craft beer has to be on tap and not in bottles – we have no problem with the latter; however, there is no difference then in making your own pizza and buying your own bottles for consumption at home. Must be in the Kanto area – we’ve extended the area out now as there are some good choices outside of the Yamanote line. 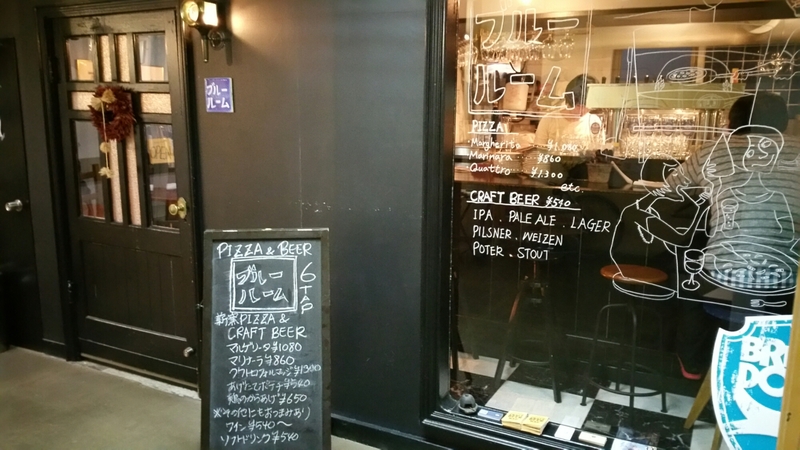 Must have Japanese craft beer on tap – else it would just be a pizzeria listing with beer. Two Dogs Taproom specialises in large New York style pizzas – large hand-tossed thin crust, often sold in wide slices to go. At Two Dogs Taproom, the pizza crust is thick and crisp only along its edge, but thin and pliable enough for you to give the slice the proper “New York Fold”. The medium pizzas (28cm) are large enough to feed two people, or one person comfortably, while the large (40cm) is enough for three to people, or two people comfortably. There is also a wide selection of beer on tap, with a decent happy hour for those people who can make it there. 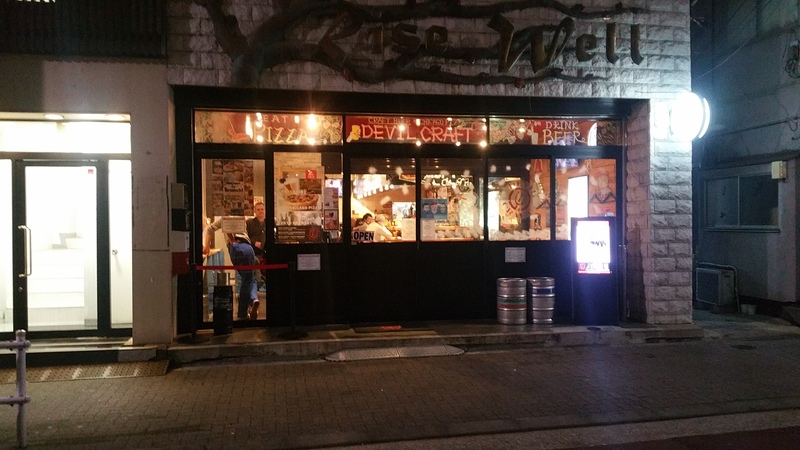 Devilcraft – perhaps one of the biggest proponents of craft beer and pizza in Tokyo, and with three locations (Kanda, Hamamatsucho, and Gotanda), you’ve always got options for some Chicago-style pizza. It’s a deep deep dish of pizza, filled with toppings, cheese, and tomato sauce. The thick layer of toppings used in deep-dish pizza requires a longer baking time, so make sure you order as soon as you get into the building. The “small” pizzas are enough for one person, or for two to share, while the large is enough for two people to feel full, or three or four to share comfortably. All the branches have plenty of choice in terms of beer, but the Hamamatsucho and Gotanda branches have the most number of taps. Baird Beer are known for having different types of food on at their taprooms. It’s a tough call between this branch and Baird Bashamichi Taproom with their BBQ’d brisket, meats, and sausages. New Haven style is not one I had heard of before coming to Japan, but it is a style of thin-crust, coal-fired Neapolitan pizza. What makes it different from a New York style pizza is its characteristic charring, chewytexture, and spartan use of melting cheeses. There are plenty of choices of pizzas on at Baird Nakameguro Taproom, but the pulled pork special – a collaboration with the Baird Bashamichi that sees them sending up some pork from their BBQ is always a hit. There is also a wide range of beers on at the taproom, with stamp cards on the go too. 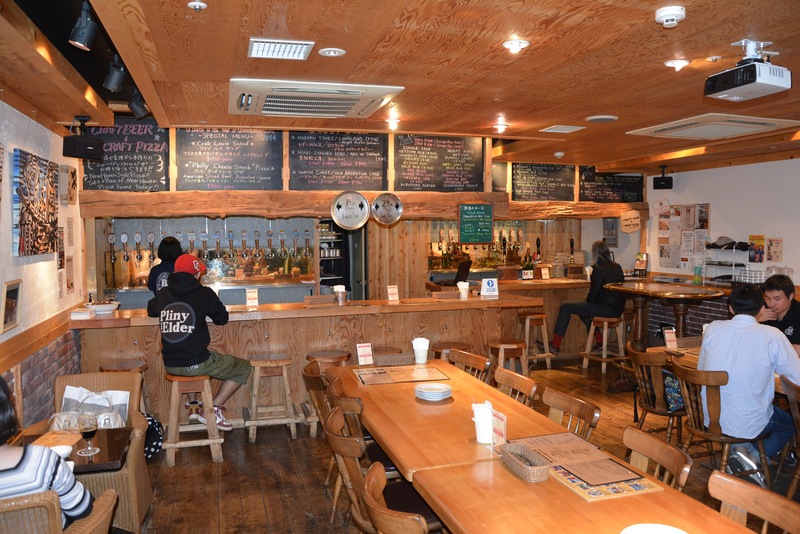 Shinjuku is slowly becoming a hotspot for craft beer in Tokyo, and with Tap Stand, it shows. 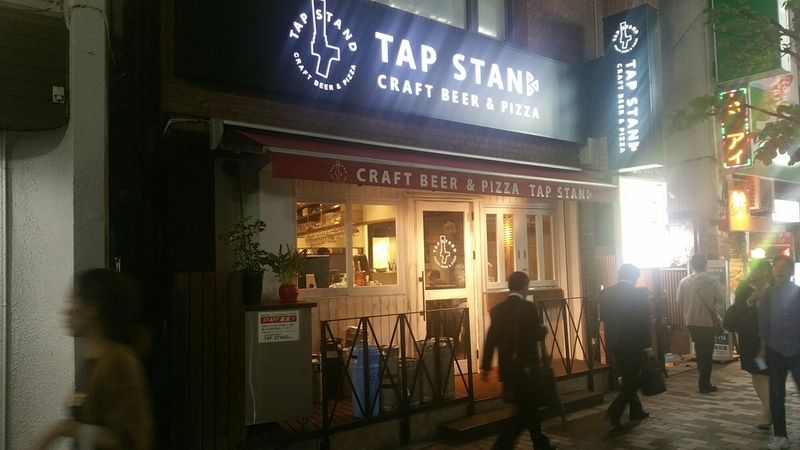 Located right by one of the exits (don’t ask which one as we often get lost), Tap Stand offers up a wide selection of pizzas, with some interesting combinations. The pizza toppings vary from traditional Italian style margarita to crazy combinations of jalapeños and pulled pork – which is damned tasty! Tap Stand has around 20 taps of local and mostly American imported craft beers to get people in. However, due to its proximity to Shinjuku station, it does get rather busy with business people and tourists in the evening. Moreover, Tap Stand is also a little on the pricey side too. We finally get to some traditional style Italian pizza on the list at Blue Room Kamakura. Blue Room is on the same street as those bars and izakayas though it is hidden upstairs on the second floor of a nondescript building on Komachi-dori that is a blink-and-miss-it. While Kamakura is yet to fully embrace the craft beer movement, Blue Room is running at the forefront of the change. For such a small shop, we were impressed with Blue Room’s full size pizza oven that occupies about 1/8th of the bar/cooking area along with an area for base preparation. The beer selection isn’t as large or varied as other places on this list, but then you are in the midst of Kamakura. So who knew that a wood-fired oven would be a different style of pizza to a stone-baked style? Not me! 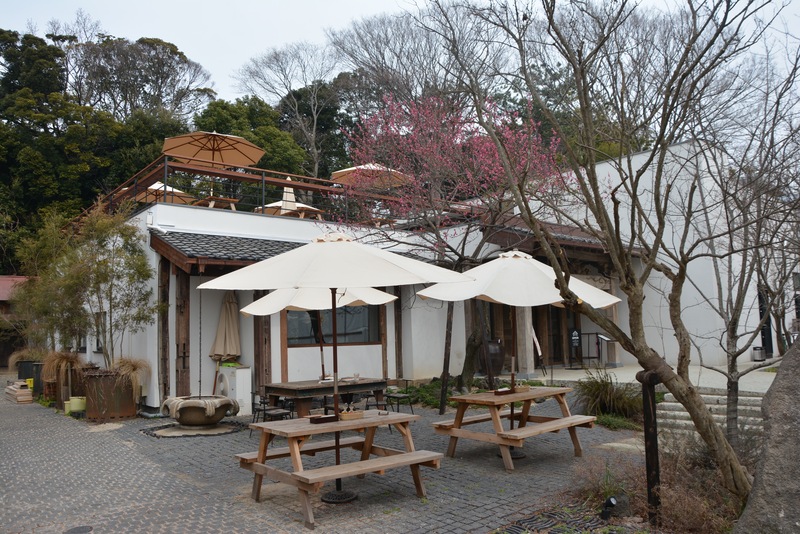 But here we are at Mokichi Trattoria – the site of both Kumazawa Shuzo (makers of sake) and also the site of Shonan Beer. It is a trek to come here; however, it is easy from Tokyo – two trains in fact! The views from the second floor are stunning so grab some pizza. While the pizzas are not the largest on this list, they are nice and chewy, with a crisp crust; however, you can still do “the fold” with them. Just be careful, as they come fresh out of the oven and are piping hot! My burnt mouth can attest to it! As it’s a Shonan Beer taproom, there are only Shonan Beers on tap – I recommend the Belgian Stout if it’s on tap, or one of the single-hop IPAs that are on sale throughout the year. Fujisawa, one of Shonan’s major cities, is a funny little place. It’s a commuter hub, with four train lines running through it, yet it lacks a decent selection of craft beer places for people to go to. 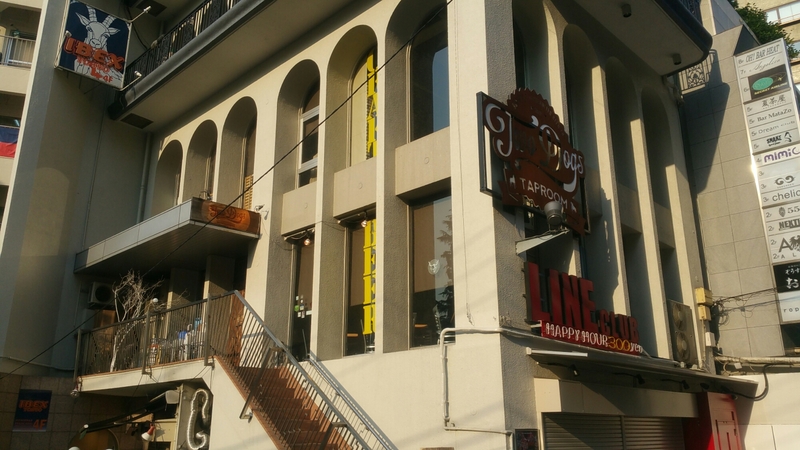 Because of that, Grano’s, as well as Shonan Beer’s Mokichi Craft Beer are prime places to go for some beers. Grano’s wins out because of the pizza – and it’s good too! The owner, Kenny, built a brick pizza oven in the style of a traditional one found in Italy, and also hands makes the dough and tomato sauce too. 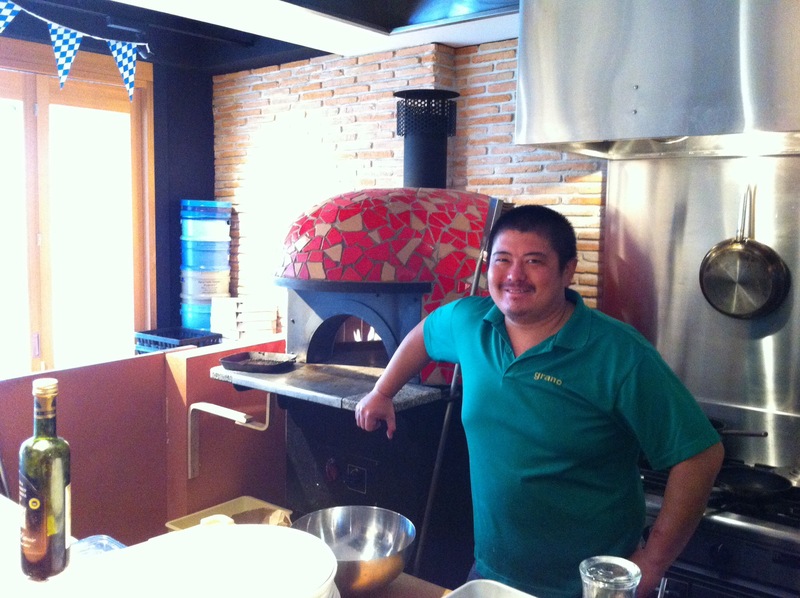 He’s an experienced pizza chef, and has worked in restaurants in Italy, Australia and of course, Japan. The pizzas are delicious, and come in two dozen Rosso and Bianco varieties (with or without tomato sauce), and there’s a great variety of Italian dishes and sides to boot. There is also a wide selection of beers to wash the pizzas down, and are split between imports and domestic beers. 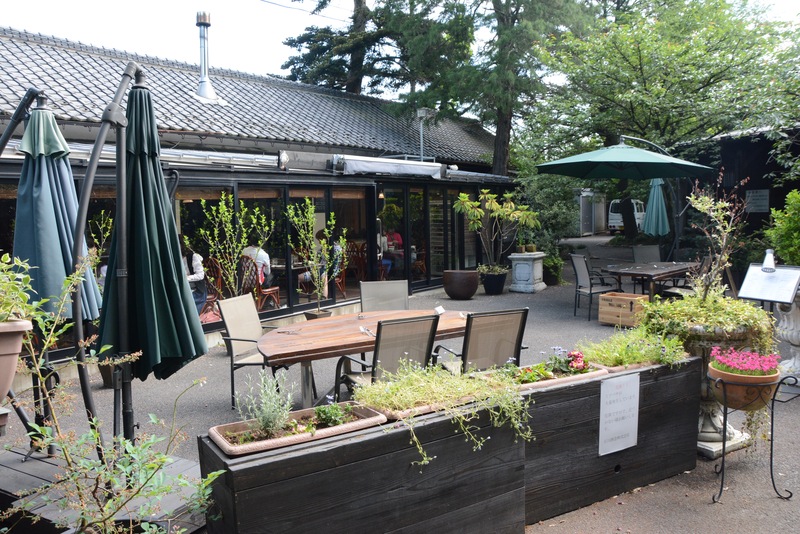 Drinking on site in a brewery is something that people forget about in Japan – many breweries offer up the experience along with tours around the premises with Ishikawa Shuzo, which means brewery, being one of them. While their beers may not be easy to find outside of the brewery, there’s plenty of places onsite to drink with Fussa no Birugoya, an Italian restaurant with pizza high on its menu, being one of them. You can also try Japanese food at other places on-site, but we want pizza! The pizzas are simple – nothing crazy with, let’s be honest, weird combinations of toppings found in Japan. The pizzas stick to tried-and-tested combinations of margarita, four cheese, anchovies, and also a daily special. The pizzas are also hand-made and tossed, with the dough made fresh instore. Combine this with some solid Japanese craft beer, and you’ll forget about being in the western suburbs of Tokyo.